An Instant Messaging Client Software Reliable Solutions for Web Business, Powerful and flexible enterprise instant messaging & presence solution with benefits for everyone in an organization. As the world has grown more dependent on the Internet, companies require more than just a web site to efficiently reach their audience, enhance client relationships and promote customer loyalty. The ability to interact and communicate with customers, employees, partners, suppliers and others via message, quickly and easily, is now vital for a company success.Rolesoft professional solutions are a must for any company or organization with an Internet presence and a communication need. Instant Messaging(IM), of course, has become a widespread phenomenon among consumers, with tens of millions logging on daily to the free instant messaging networks provided by America Online, Yahoo!, and Microsoft's MSN unit. And as a result, businesses are increasingly looking for ways to make IM use in the workplace safe, secure, and a productive part of workers' everyday lives. Rolesoft Messenger Server--an instant messaging platform that means business.Role Instant Server is a powerful and flexible enterprise instant messaging & presence solution with benefits for everyone in an organization. Employees will be happy with the uncluttered, distraction-free, multi-protocol desktop IM client . CIOs and IT administrators will be happy with Rolesoft admin tools. CFOs will be happy with Rolesoft's price tag. And let's not forget CTOs and software developers -- they will like Rolesoft's support for enterprise application integration (EAI). In addition to supporting the major public IM services, Rolesoft Messenger supports Rolesoft enterprise IM solution -- Rolesoft Instant Message Server.Future enhancements of Rolesoft Messenger are already in development to provide a rich set of enterprise IM features. 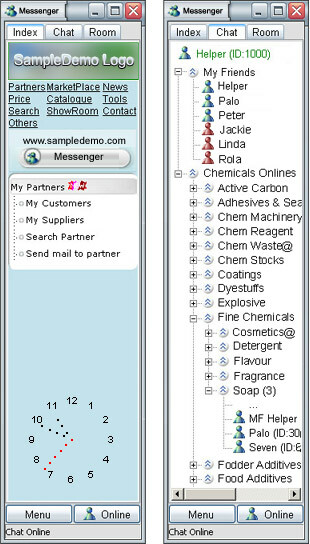 Rolesoft Messenger can be designed to the following specific trade categories: Agriculture, Apparel & Fashion, Chemicals Food & Beverages, Textiles & Leather, Energy Home Appliances, Computer ,Minerals & Materials & Metal Home Supplies, Telecommunications, Industrial Supplies Office Supplies, Electronics & Electrical, Packaging & Paper Gifts & Crafts, Security & Protection ,Printing & Publishing Toys, Construction, Environment Sports & Leisure, Automobile, Excess Inventory Health & Beauty, Transportation, Business Services,and so on. BlazingTools Instant Source - New IE Pane-shows HTML in real time; extracts CSS, scripts, flash movies, images. InstantInvoice 3 - Billing software or business invoice software for the small business. Hot! WinMessenger - Easy to use & convenient WinPopup replacement that works in any Windows version.